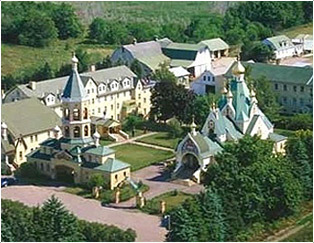 Individuals that wish to make an overnight or weekend trip to visit the monastery should contact the guesthouse to make arrangements for their stay. Longer visits may also be arranged, but individuals should seek a blessing from our abbot. Individuals that are organizing trips on the behalf of large groups should also get in touch with our abbot as well as informing the guesthouse well in advance of visiting, as we cannot always accommodate large groups during certain festal seasons or in preparation for scheduled events. For all groups requesting 5 rooms or more, a non refundable deposit of 50% of the total cost of the reserved rooms will be required at time of booking. Please remember that this is a monastic community and that the church is consecrated to the glory and worship of God. While on monastery grounds, kindly show respect for the religious beliefs and customs of our community. No one wearing shorts or dressed immodestly should enter the grounds of the monastery. Women wishing to enter the church are kindly asked to wear a head covering and a skirt or dress. Men should not be wearing t-shirts or short pants. Guided tours may be arranged by calling the monastery office at 315-858-0940. The monastery guesthouse, located a short distance from the monastery, offers accommodation for both men and women at a very modest rate. Holy Trinity Cathedral is normally open only during services; services are open to the public, although those with no experience of Orthodox worship are asked to remain at the back of the church. We invite you as the Apostle Philip did to Nathaniel to "Come and see" (Jn 1:45-46) and experience Orthodox Christian worship. Following services, you are invited to join us in the trapeza for a brief monastic meal. The weekday service schedule (Sunday evening through Saturday morning) is as follows (times are approximate): 5:00–7:15 am: Midnight Office, 3rd and 6th Hours, Divine Liturgy; 4:00-6:30 pm: 9th Hour, Vespers, Matins, 1st Hour; 7:30-8:15 pm: Small Compline. On Saturday evenings and the eve of feast days, Vigil is from 7:00 to approximately 10:30. On Sunday mornings and feast days, the Divine Liturgy is from 9:00 (or 9:30) to approximately 12:00. Any changes to service times are posted on the doors of the church, on the bulletin board at trapeza, and outside the main entrance doors to the monastery. The bookstore, which carries a large selection of Orthodox Christian literature in both English as Russian, as well as CDs and devotional items, is located on the ground floor of the west annex in the main monastery corpus. Please visit the bookstore website to see their hours. Closed on major feast days. Просьба помнить, что это монашеская община, и что церковь освящена во славу и поклонение Богу. Находясь на территории монастыря, проявляйте уважение к вере и обычаям нашего монастыря. Никто не должен входить на территорию монастыря в шортах или нескромно одетым. Женщин, желающих войти в церковь, просим носить юбку или платье и покрыть голову. Для заказа экскурсии, пожалуйста, звоните в монастырскую канцелярию по телефону, указанному ниже. Монастырская гостиница, расположенная вблизи монастыря, предоставляет размещение для мужчин и женщин по очень скромной цене. Свято-Троицкий собор, как правило, открыт только во время богослужений, которые дозволяется посещать нашим гостям. Однако тех, кто не имеет опыта православного богослужения, просим оставаться в задней части церкви. С 9:00 (или 9:30) примерно до 12:00. Уточнения см. на интернет- сайте монастыря. Книжный магазин предлагает большой выбор православной литературы на английском и русском языках, а также компакт-дисков, церковной утвари и предметов домашнего православного обихода. По воскресеньям, праздникам: открыт на один - два часа после обеда.